The patented spring bar technology is at the heart of every Strawmaster®. 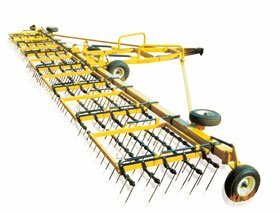 The simple torsional spring bar design is unlike other heavy harrows, Strawmaster uses a spring bar system that lets you apply downward pressure to the harrow sections as you need it. These twin spring bars allow in-cab hydraulic control by applying pressure from zero to 1900 pounds per harrow section. If you don't need pressure, just put it in float. The tine bar sections are either a four bar section (narrow model Strawmasters) or a five bar section (Strawmaster 7000). Both offer standard 5/8" x 26" straight tines with an optional 9/16" x 26" straight tine also available. The tine bars easliy drop out by simply removing a few bolts making tine replacement faster and easier. The The Carbide Endura-Tip by Atom Jet is an exclusive option to Degelman Strawmasters that will significantly increase the life and performance of your harrow bar. The tungsten carbide tipped harrow tines maintain their original length and shape, resulting in enhanced control and a more consistent field finish. The primary purpose of the Strawmaster® is to breakup and spread most types of straw residue efficiently. High frequency vibration provides the shattering action for perfect residue control. For most farming practices, speeds of up to 12 m.p.h. can be attained. The Strawmaster® is quickly becoming the most popular machine for raking flax straw. It can maximize holding capacity by applying pressure through the spring bar control. Strawmaster is specifically designed for today's continuous cropping practices. It is the product of the latest technological innovations, solid engineering and superb craftsmanship. And you won't find a better harrow bar for applying herbicide: travel at higher speeds than conventional harrow bars without skipping, hold larger loads of straw, and adjust your machine to tailor your needs. Incorporating is obviously a natural for Strawmaster. These heavy extra long tines are much stiffer than conventional tines and offer better penetration of built up straw mulch. Just set the machine to the aggressive setting you need. And with Strawmaster's spring control bars you can increase the pressure for even, more continuous penetration. What's more, we've designed built in mounts for herbicide applicators within the cart. Mounting your applicator will be a breeze. Moderate field packing can be easily achieved by lowering the machine and leaning back the tines. As the angle of the tines is adjusted, the cart and frame should be levelled to correspond. The cart is carried independently by two large 16.5L Softrac II tires and the height is changed by heavy duty ratchets. The optional "Hydraulic Tine Angle Kit" also includes two 3" x 8" cylinders for hydraulic trailer height levelling. herbicide applicators are found on the Strawmaster 7000. VALMAR provides an excellent implement mounted Granular Applicator for Herbicides and Seeds. This option can be factory installed by Degelman or purchased and installed seperately. An optional platform is also available for the Strawmaster 7000.